Axis Condos is a new per-construction project located at 411 Church Street in Toronto. Boasting great transit access, plenty of shopping options, and a lively cultural scene, several of the major players in Toronto’s development community are investing in the Church-Wellesley Village area. Just north of the Church and Carlton intersection, CentreCourt Developments recent 38-storey proposal at 411 Church Street is now hitting the market with the moniker ‘Axis Condos’, accompanied by polished new renderings that highlight the project’s textured Page + Steele / IBI Group Architects design. Across from a historical landmark in Toronto. 1 city block from Yonge/College and PATH (250m). An intersec,on with traffic volume of 95,650. 158,000 people that work and study within 1km. 7-minute walk to Toronto General Hospital (550m). 7-minute walk to Ryerson University (550m). 8-minute walk to Eaton Centre (650m). 12-minute walk to U of T (950m). All of this means a rental base that is varied. • Office workers in the area. • University students and staff. Axis Condos site is positioned between Church Street and Carlton Street, The Project height of 491 feet, Total of 45 storeys with a 7 storey podium, total 583 residence units. Architect by Page + Steele / IBI Group Architects, Landscape architect done by Strybos Barron King. Axis Condos will put a playful spin on the rectilinear point tower-and-podium building typology with a honeycomb-like geometry marking the building’s balconies. 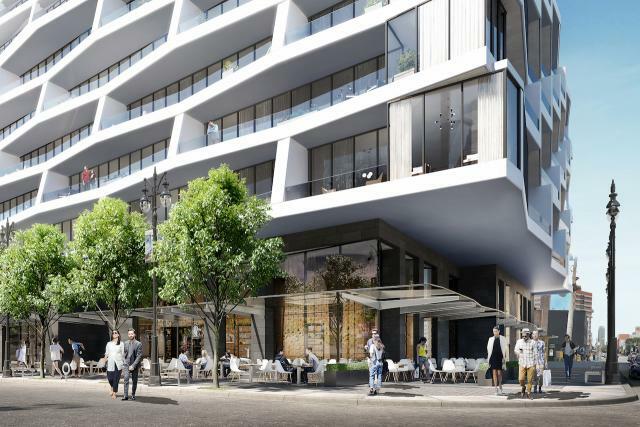 The tower will rise from a six-storey podium, with renderings depicting street-level patios greeting the sidewalk, and exterior landscaping designed by Strybos Barron King. Axis Condos will heal a longstanding tear in the area’s urban fabric, replacing an under-utilized surface parking lot with a street-friendly development. Above the ground level, 451 condominium units are on offer, all a short elevator ride from Loblaws’ flagship Maple Leaf Gardens location right across the street, and plentiful neighbourhood shops, eating establishments, and nightlife venues to the north and south. Axis is also very handy to Ryerson University. Axis Condos has a Walk Score of 98 out of 100. The Perfect transit Score 100 out of 100.This location is in the Church-Yonge Corridor neighborhood in Toronto. Nearby parks include Joseph Sheard Parkette, Alexander Street Parkette and Allan Gardens.